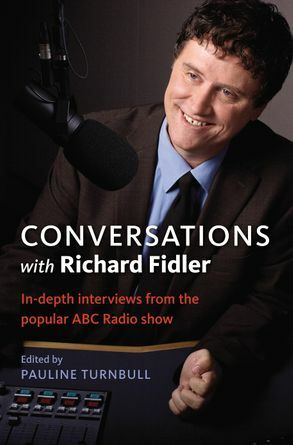 From one of Australia's best interviewers comes CONVERSATIONS WITH RICHARD FIDLER a collection of fifteen outstanding interviews with ordinary - but stilll remarkable - people, from the popular daily ABC Local Radio Show. CONVERSAtIONS WItH RICHARD FIDLER takes you into the exceptional lives of people you've never met... people who were living ordinary lives when Something Happened. there's an explorer who mapped Antarctica in the fifties, with heavy woollen clothing and dog sleds under the shimmering polar sky; a principal who brought philosophy to every part of her primary school's curriculum and saw the children benefit academically and emotionally; the casting director who discovered as a schoolgirl that her father had been importing large amounts of heroin when police raided the family home; the cartoonist and artist Bill Leak who recounts his bizarre hallucinatory experience of recovering from a head injury ; a community activist and former gangster who experienced a religious moment when a gun was put to his head; and a man who decided to set off in a kayak one day from the Victorian border and kept going all the way to Papua New Guinea. In this collection of fifteen stories, Richard Fidler skill as an interviewer is revealed as he draws out people's deepest hopes and fears, and their stories of ingenuity, failure, triumph and loss. Peter Thompson is a well-respected broadcaster, journalist and media consultant. He is the host of TALKING HEADS. Pauline Turbull is a key researcher for the program.